compiled by Yasoda nandana dasa Srila Prabhupada explains how Sri Baladeva Vidyabhusana wrote the Gaudiya-Bhasya on the Vedanta-sutras. Lectures : Bhagavad-gita Lectures : Bg 13: Lectures : Bhagavad-gita 13.8-12 — Bombay, September 30, 1973 : 730930BG.BOM : But sometimes back, in Jaipur, there was a challenge that “The Gauḍīya Sampradāya has no commentary on the Vedānta-sūtra.” So at that time Viśvanātha Cakravartī Ṭhākura was requested… Because he was grand scholar, grand old man scholar, at that time living in Vṛndāvana… So he was very old at that time; so he authorized Baladeva Vidyābhūṣana, that “You do it.” There was no need, but people are demanding, “Where is your commentary on the Vedānta-sūtra?” So Baladeva Vidyābhūṣana, with the order of Govindaji at Jaipur, he wrote the commentary on Brahma-sūtra. That name is Govinda-bhāṣya. So the Gauḍīya-Brahmā Sampradāya, they have got also commentary on Brahma-sūtra. That is required. Prabhupāda: So, it is actually bhāṣyāyāṁ brahma-sūtrāṇām. It is stated. This is the real commentary on Brahma-sūtra by Vyāsadeva himself, author. Vyāsadeva is the author of Brahma-sūtra, and he has written personally, under the instruction of his guru, Nārada Muni, this Brahma-sūtra-bhāṣya. And it begins with the Brahma-sūtra aphorism: janmādy asya yataḥ [SB 1.1.1]. The Brahma-sūtra begins with these words: janmādya, athāto brahma jijñāsā. Janmādy asya yataḥ. So these things are explained elaborately. Therefore Brahma-sūtra-bhāṣya, bhāṣyāyāṁ brahma-sūtra. Vedārtha paribṛṁhita. So therefore in our Gauḍīya, Caitanya Mahāprabhu did not write any bhāṣya of the Brahma-sūtra, neither the gosvāmīs, because they took it that Śrīmad-Bhāgavatam is the real bhāṣya of Brahma-sūtra. But when…. Sometimes the Gauḍīya Vaiṣṇavas are challenged that “You cannot be accepted as bona fide community, spiritual community, because you have no bhāṣya on Brahma-sūtra.” Then Baladeva Vidyābhūṣaṇa wrote govinda-bhāṣya. But Caitanya Mahāprabhu did not like or ask His disciples to write, because He thought, “This is the Gauḍīya, Brahma-sūtra-bhāṣya.” Not Gauḍīya—for every Vaiṣṇava. Bhāṣyāyāṁ brahma-sūtrāṇām. So we have got now Gauḍīya Vedānta-bhāṣya. Rāmānuja Vedānta-bhāṣya is there. Madhvācārya Vedānta-bhāṣya is there, all. And Gauḍīya had not. But since this challenge was made in Jaipur, then Baladeva Vidyābhūṣaṇa, he took: “Yes,” and he finished, Gauḍīya bhāṣya, and it is called Govinda-bhāṣya. Actually, in India, unless one follows the ācāryas and has given commentary on the Brahma-sūtra, he’s not a bona fide. Nyāya-prasthāna. Brahma-sūtra is called nyāya-prasthāna. Śruti-prasthāna, smṛti-prasthāna, nyāya-prasthāna. So any bona fide ācārya must give his understanding about these three prasthānas.. Guest (1) (Indian man): …cultural affairs, Orissa government. Here there is a large stack of palm leaf manuscripts. Palm leaf manuscripts. We are editing the Sanskrit manuscripts, correcting them and publishing them. Prabhupāda: It is published in Sanskrit? Guest (2) (Indian man): Palm leaves. Hari-śauri: Some manuscripts on palm leaf. Hari-śauri: They’re translating and publishing. So he is the editor in charge of all that for the government. Guest (1): What is the…? Srila Prabhupāda: What is the śāstra? Hari-śauri: What is the name of the śāstra? Guest (1): Śāstra. I told yesterday Bhakti-bhāgavatam of Kavisurya Baladeva(?). Srila Prabhupāda: Oh, yes, yes. Guest (1): And ācārya, there is one… (quotes long Sanskrit verses) This is one Rādhā-Kṛṣṇa līlā by Kavisurya Baladeva of Orissa. Guest (1): Baladeva Vidyābhūṣana who commented on, wrote Śrī Bhāṣyam..
Gurukṛpa: That’s the same one you just quoted? By who? Gurukṛpa: The one you just sang. Guest (1): No. This is Kavisurya Baladeva. Srila Prabhupāda: Baladeva Vidyābhūṣana, different. Srila Prabhupāda: Baladeva Vidyābhūṣana belonged to Orissa or Bengal? Guest (1): Yes, Orissa. And he has clearly mentioned that near Tilika, Tilika Lake he was born. It is clear mentioned. 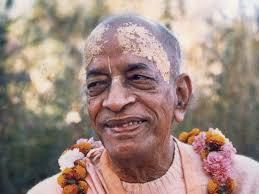 Srila Prabhupāda: But he used to live in Balasore. Guest (1): Yes. He used to live in Balasore, and then went to Bhastrana,(?) where he wrote Bhāṣya on Vedānta-sūtra and Gītā. Prabhupāda: Vedānta-sūtra, Govinda-bhāṣya, he wrote in Jaipur. Guest (1): Jaipur. Yes, last time, Jaipur. Srila Prabhupāda: I have dedicated my Bhagavad-gītā to Baladeva Vidyābhūṣana. Guest (1): Baladeva Vidyābhūṣana? Following Baladeva Vidyābhūṣana? Hari-śauri: He dedicated it. Yes, this is… Śrīla Baladeva Vidyābhūṣana. So Sanātana Gosvāmī, he’s ācārya in this disciplic succession from Caitanya Mahāprabhu, Lord Caitanya. He is the first disciple of Lord Caitanya, and from him, Sanātana Gosvāmī, six Gosvāmīs. There were six among the first followers of Lord Caitanya. And then, from next step comes Raghunātha Gosvāmī and then this author of this book, Kṛṣṇa dāsa Kavirāja Gosvāmī, and from him, Narottama dāsa Ṭhākura, and then from him, Viśvanātha Cakravartī, Baladeva Vidyābhūṣaṇa. In this way this disciplic succession is coming from Lord Caitanya. So as ācārya… Ācārya means one who knows the principles of scripture, properly being initiated by authority who knows things as they are, and they apply those things in their own life. They are called ācārya. Acinoti śāstrāṇi: he must know all the principles from authorities, and he should apply in his life those principles. Not that he knows but does not apply. He cannot be ācārya. Āpani ācari prabhu jīva disa (?). Lord Caitanya, He, although He is accepted as the, I mean to say, the personal, He’s Kṛṣṇa Himself, still, He behaved in such a way that others can follow. He also accepted Īśvara Purī. Īśvara, Īśvara Purī was His spiritual master, Lord Caitanya’s. This is the disciplic succession. Prabhupāda: Then, from Kṛṣṇa, Nārada. From Nārada, Vyāsadeva. From Vyāsadeva to Madhvācārya, from Madhvācārya to Īsvara Puri, Mādhavendra Puri, then Caitanya Mahāprabhu, then His disciples, the six Goswāmīs, then Kṛṣṇa dāsa Kavirāja, then Baladeva Vidyābhūṣaṇa. So we are taking account very rigidly from Caitanya Mahāprabhu, and I am the tenth generation from Caitanya Mahāprabhu. Sri Baladeva Vidyabhusana explains the suvarna-varna hemango citation to establish Lord Caitanya as the yuga-avatara. suvarṇa—of gold; varṇaḥ—having the color; hema-aṅgaḥ—whose body was like molten gold; vara-aṅgaḥ—having a most beautiful body; candana-aṅgadī—whose body was smeared with sandalwood; sannyāsa-kṛt—practicing the renounced order of life; śamaḥ—equipoised; śāntaḥ—peaceful; niṣṭhā—devotion; śānti—and of peace; parāyaṇaḥ—the highest resort. Lord Caitanya accepted sannyāsa, leaving aside His householder life, to preach His mission. He has equanimity in different senses. First, He describes the confidential truth of the Personality of Godhead, and second, He satisfies everyone by knowledge and attachment to Kṛṣṇa. He is peaceful because He renounces all topics not related to the service of Kṛṣṇa. Śrīla Baladeva Vidyābhūṣaṇa has explained that the word niṣṭhā indicates His being rigidly fixed in chanting the holy name of Śrī Kṛṣṇa. Lord Caitanya subdued all disturbing opponents of devotional service, especially the monists, who are actually averse to the personal feature of the Supreme Lord. Sri Caitanya-caritamrta – 1975 Edition : Cc. Adi-lila The External Reasons for Lord Caitanya’s Appearance : Adi 3.49 . When a person thinks ‘I am doing this,’ the ‘I am’ does not refer to the body. It refers to something more than the body, or within the body. As such, the body as it is has neither tendencies nor intuition; the tendencies and intuition belong to the soul within the body. Material scientists sometimes suggest that the tendencies of male and female bodies cause their union and that this is the cause of the birth of the child. But since the puruṣa, according to Sāṅkhya philosophy, is always unaffected, where does the tendency to give birth come from? “Sometimes material scientists give the example that milk turns into curd automatically and that distilled water pouring from the clouds falls down to earth, produces different kinds of trees, and enters different kinds of flowers and fruits with different fragrances and tastes. Therefore, they say, matter produces varieties of material things on its own. In reply to this argument, the same proposition of the Bṛhad-āraṇyaka Upaniṣad-that different kinds of living creatures are put into different kinds of bodies by the management of a superior power-is repeated. Under superior superintendence, various souls, according to their past activities, are given the chance to take a particular type of body, such as that of a tree, animal, bird or beast, and thus their different tendencies develop under these circumstances. The Bhagavad-gītā (13.22) also further affirms. ‘The living entity in material nature thus follows the ways of life, enjoying the three modes of nature. This is due to his association with that material nature. Thus he meets with good and evil among various species.’ The soul is given different types of bodies. For example, were souls not given varieties of tree bodies, the different varieties of fruits and flowers could not be produced. Each class of tree produces a particular kind of fruit and flower; it is not that there is no distinction between the different classes. An individual tree does not produce flowers of different colors or fruits of different tastes. There are demarcated classes, as we find them among humans, animals, birds and other species. There are innumerable living entities, and their activities, performed in the material world according to the different qualities of the material modes of nature, give them the chance to have different kinds of life. Sri Caitanya-caritamrta Lectures : Madhya-lila: Lectures : Madhya 20: Lectures : Sri Caitanya-caritamrta, Madhya-lila 20.100-108 — New York, November 22, 1966 : 661122C2.NY : So Sanātana Gosvāmī, he’s ācārya in this disciplic succession from Caitanya Mahāprabhu, Lord Caitanya. He is the first disciple of Lord Caitanya, and from him, Sanātana Gosvāmī, six Gosvāmīs. There were six among the first followers of Lord Caitanya. And then, from next step comes Raghunātha Gosvāmī and then this author of this book, Kṛṣṇa dāsa Kavirāja Gosvāmī, and from him, Narottama dāsa Ṭhākura, and then from him, Viśvanātha Cakravartī, Baladeva Vidyābhūṣaṇa. In this way this disciplic succession is coming from Lord Caitanya. So as ācārya… Ācārya means one who knows the principles of scripture, properly being initiated by authority who knows things as they are, and they apply those things in their own life. They are called ācārya. Acinoti śāstrāṇi: he must know all the principles from authorities, and he should apply in his life those principles. Not that he knows but does not apply. He cannot be ācārya. Āpani ācari prabhu jīva disa (?). Lord Caitanya, He, although He is accepted as the, I mean to say, the personal, He’s Kṛṣṇa Himself, still, He behaved in such a way that others can follow. He also accepted Īśvara Purī. Īśvara, Īśvara Purī was His spiritual master, Lord Caitanya’s. This is the disciplic succession. Born in a Khandite (arguibly, vaisya)family at the end of the 17th century in a village nearby Remuna in the district of Balasore, Orissa, a boy of extreme sharp intellect and an exceptional talent for logical reasoning would later on by the blessings of our most beloved deity, Sri Govinda deva, become known as Srila Baladeva Vidyabhusana, the author of ‘Sri Govinda bhasya’, the treatise that established gaudiya vaisnavism as a bona fide school of vedanta . In his childhood, he studied grammar, nyaya, alankara, etc. in a traditional pathasala on the bank of the Chilka lake. Having quickly mastered all the different subjects, he left for pilgrimage, in search of a guru who could impart to him the real import of the Vedic knowledge. In Mysore he eventually came in contact with a sannyasi from the Madhva sampradaya who strongly preached to him the tattvavada, convincing him not only to accept Madhvacarya’s siddhanta, but also to renounce the world and preach it. Concluding his studies of the Vedas, Vedanta and the Sarva-mula of Madhvacarya, the young sadhu left for Jagannatha Puri, where he challenged and defeated all the opponent scholars present there in very intense debates on sastra. By the divine providence, one day he attended a lecture given by a foremost disciple of the gaudiya vaisnava acarya, Srila Rasikananda, called Sri Radha-damodara. The lecture was on the famous treatise written by Srila Jiva Gosvami- the Six Sandarbhas. After several days hearing the sweet topics about Sri Caitanya Mahaprabhu’s acintya-bhedabheda-tattva in such impressive and logical exposition, Baladeva surrendered himself unto Srila Radha-damodara requesting him to be accepted as a disciple and fully taught the gaudiya philosophy. Taking up the simple dress of a gaudiya vaisnava mendicant, he was given the name ‘Ekanti Govinda dasa’ . Being surcharged by the taste of the philosophy expounded by the six Gosvamis of Vrndavana- Rupa, Sanatana, Gopala, Jiva, Raghunatha dasa and Raghunatha Bhatta- he left for Vrndavana to dedicate his life to Lord Caitanya’s mission. 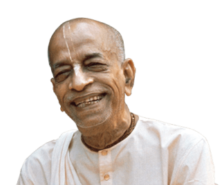 At that time, the leader of the gaudiya vaisnava community was Srila Visvanatha Cakravarti, who being pleased with Ekanti Govinda dasa, taught him Srimad Bhagavatam and other vaisnava scriptures. 1) They did not seem to be connected to a bona fide parampara in terms of philosophical affiliation, since they lacked a commentary on the Vedanta Sutra. 2) According to the standard of the Sri vaisnavas, Lord Narayana is the original form of God and the source of all incarnations, and therefore He should be worshiped first. The gaudiyas, however, were worshipping Govinda before Narayana. 3) The ramanandis considered the worship of Srimati Radharani as unprecendented and irregular, and therefore they objected and even removed Her from the altar, thus separating Her from Govindaji. Vidyabhusana, and Who spoke this commentary to me in dreams”. śiṣya—disciples; paḍichā—and watchmen; dvārā—by means of; prabhu—Lord Śrī Caitanya Mahāprabhu; nila—brought; vahāñā—carrying; ghare—at home; āni’-bringing; pavitra—purified; sthāne—in a place; rākhila—kept; śoyāñā—lying down. While Lord Caitanya Mahāprabhu was unconscious, Sārvabhauma Bhaṭṭācārya, with the help of the watchmen and some disciples, carried Him to his home and laid Him down in a very sanctified room. tāṅhāra—his; ananta—unlimited; guṇa—qualities; ke—who; karu—can; prakāśa—display; tāṅra—his; priya—dear; śiṣya—disciple; iṅha—this person; paṇḍita haridāsa—of the name Haridāsa Paṇḍita. Ananta Ācārya was a reservoir of all good qualities. No one can estimate how great he was. Paṇḍita Haridāsa was his beloved disciple.